Arthur Bertram Culthbert Walker, Jr.
His paternal grandfather was James Henry Walker, a schoolmaster from Barbados. James emigrated to St. Vincent with his wife, Millicent, around the the first part of the 20th century. As an educator, he had great expectations for his four daughters and four sons. James's second son, Cuthbert, emigrated to New York to study at City College and work for the Erie Railroad. When the Depression struck, Erie Railroad moved its headquarters in the early 1930s to Cleveland. Cuthbert followed his job. There, he attended John Marshall Law School and met his future wife. Walker's maternal grandfather, Ormand Forte, was also from Barbados and emigrated to the United States with his wife, Ida. The ambitious Forte attended Macalester College in St. Paul and worked for Hanna Steel in Cleveland. The Fortes had a daughter, Hilda, in 1911. Steel magnate Mark Hanna noticed young Ormand and helped him set up an African American newspaper in Cleveland just four years later. The Advocate grew in influence and spawned three other papers. Arthur Betram Cuthbert Walker was born an only child in Cleveland on Aug. 24, 1936. He had no siblings but was close to his many cousins. In 1941 the family moved to New York, where Walker's father set up his own law practice. Young Arthur loved science. Both of his parents supported him, but his mother, Hilda, was especially key in his development. She organized parents at his elementary school to fight a problem of teachers leaving the school during the day for errands. This led to a transfer to a new school outside their district. There, Arthur discvered the library and science. His new goal became to study the universe like Albert Einstein. His mother encouraged him to take the test for the Bronx High School of Science. His first love was chemistry, but when his teacher tried to discourage him, Hilda stepped in again and told the teacher in no uncertain terms that her son would study whatever he pleased. When Walker then decided to pursue physics, his mother encouraged him to apply to the Case Institute of Technology in Cleveland. Arthur Walker earned a baccalaureate degree in physics with honors from there in 1957. He went on to pursue and earn a master's degree in 1958 and doctorate in 1962 from the University of Illinois. His dissertation was on the use of radiation to produce the particles that bind protons and neutrons together in the atomic nucleus. In 1962 he joined the U.S. Air Force as a 1st lieutenant. His first assignment was to the Air Force Weapons Laboratory. There he was instrumental in developing instrumentation for an experiment that involved rocket launch of a satellite to measure Van Allen belt radiation in the Earth's magnetic field which affects satellite operation. This work ignited his interest in research carried out with space techniques. Walker left the service in 1965, when his commitment was up. He then joined the Space Physics Laboratory of the Aerospace Corporation, where for 9 years he conducted pioneering physics experiments to study the sun and upper atmosphere of the Earth. Arthur B. Walker started out in nuclear physics, but earned a Ph.D. in Astrophysics. From 1975 to 1985 Walker did pioneering work studying the X-ray spectrum of the solar corona and in the 1990s he lead a team of scientists who, among other things, were the first to apply normal incidence X-ray optical systems to astronomical observation. But Walker may be best known as the mentor of Sally Ride, the first female astronaut to obit the Earth, and for chairing the presidential commission that investigated the 1986 space shuttle Challenger disaster. Walker is one of nation's bright lights in solar research. He has used his X-ray vision to see inside the sun's surface. As a solar physicist, he is a leader in the use of thin films and X-rays to study its corona. Since 1987, telescopes Walker has developed have ridden satellites into space, capturing the first pictures of that corona. In addition, Walker's penetrating long-range vision has resulted in Stanford having more minority graduate physics and applied physics students than any major research university in the country. Ever since his irate mother, Hilda, stormed into the highly academic Bronx High School of Science and set his teacher straight about discouraging her son from studying science because he is African-American, Walker has been steady on the course. Friends, colleagues and family recently celebrated his work at a campus dinner. The 64-year-old Walker was been ill since June 2001, and was recovering from the effects of radiation and chemotherapy. Stanford mathematics Ph.D.and psychology professor Ewart Thomas has been a friend for many years. ``Art says, `You know, Ewart, all I ever wanted to be was a physicist. I've had a good life and I wanted to help students see the marvel of physics and I've done both.' '' Looking ahead Astronaut Sally Ride was his first doctoral candidate. But Walker has big plans for the future. He is working with Stanford scientist Blas Cabrera, using a technique that Cabrera and his students developed which permits them to measure energy very precisely and which allows them to measure the energy of individual X-rays from the sun. That is of value, Walker said, because it permits better analysis of the sun's composition, such as which elements are emitting radiation. And because things done in a lab must eventually be proven in space, Walker said, ``We are planning to launch a rocket probe in a couple of years to produce some high resolution spectra of the sun which we will use to demonstrate our new technique.'' Bob Beyer, Stanford's chair of applied physics, has known Walker nearly 30 years. ``I still remember the sparkle in his eye when he came with his very first X-ray image of the sun,'' Beyer said. ``He had just had a major breakthrough and he was thrilled. Art has this sort of soft-spoken, but always present-there, style.'' Modest star Those who know him understand what Beyer means. Walker is a person you can know for years and will never hear from him that when Challenger exploded, the president of the United States appointed him to the prestigious investigative committee. Friends can ask what he's up to and never hear that more than a dozen telescopes he developed were on certain space missions. Thomas says he is a ``gentleman scientist.'' In retrospect, Walker the astrophysicist is a little like the sun that he covets -- not the noonday sun, but the rising sun where people see a warm, subtle glow masking the powerful light just below the horizon. His wife, Victoria, of 17 years, recalls first meeting him and thinking, ``An astro what?!'' Walker downplayed it. ``I had to pull it out of him,'' she said. ``I've always known that he was special,'' she said. ``I'm just pleased that everyone else has found out.'' At the dinner, Beyer likened him to hokule'a which is a Polynesian name for a star that guided sailors in canoes from Tahiti to Hawaii. ``I said, `You have, by example, been the guide star by which many students have navigated early in their careers.'' And only Walker might ask him for empirical data. After earning his Ph. D., Arthur Walker joined the Air Force Weapons Laboratory, 1962-65. From 1965 to 1973 he worked at AerospaceCorporation where, from 1971-73, he directed the Astronomy Program. He joined Stanford university as Professor, in 1974. From 1976-80, he was Associate Dean of Graduate Studies. 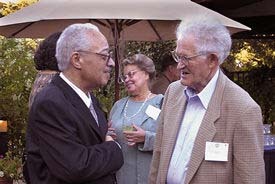 On September 15, 2000, Stanford had a celebration of his achievements sponsored by the departments of Physics and Applied Physics and the African and Afro-American Studies Program. Professor Walker's research interests are focused on the development of innovative space-borne instruments for the study of high temperature astrophysical plasmas, and the sse of X-ray far ultraviolet, and extreme ultraviolet techniques to study other astrophysical phenomena such as the elemental abundances in the interstellar medium. Among the techniques used are high resolution X-ray spectroscopy using Bragg crystals and diffraction gratings, and high resolution X-ray imaging using both grazing incidence and normal incidence X-ray optical systems. From 1965-1975, Professor Walker and his former collaborator, H.R. Rugge carried out several of the pioneering studies of the X-ray spectrum of the solar corona. In the early 1990's, a group lead by Professor Walker, which included T.W. Barbee and R.B. Hoover, pioneered the application of normal incidence X-ray optical systems to astronomical observations. Professor Walker's group's primary current interest is the study of the physical processes underlying the structure and dynamical behavior of the solar corona and chromosphere, using observations from a variety of spacecraft, including the NASA/ESA SOHO Observatory and the Walker group's Multispectral Solar Telescope Array. In preparation for the launch of NASA's AXAF X-ray Observatory in 1998, Professor Walker's group will be utilizing both space observations and ground-based observations (from the Hobby Eberly Telescope) to study phenomena associated with stellar chromospheres and coronae, supernova remnents, the interstellar medium, and clusters of galaxies. Professor Walker's group currently is establishing a Stanford AXAF Science Center, which will provide access to AXAF observations for astronomers in the western United States. Professor Walker's group is also involved in the application of X-ray technology to disciplines other than astronomy. Examples include X-ray imaging and X-ray microscopy of biological materials. These activities, as well as the group's astrophysical research, make extensive use of the Stanford Synchrotron Radiation Laboratory. Dr. Walker joined the faculty of Stanford University in 1974 as a member of the Department of Applied Physics. His scientific field of expertise was Extreme Ultraviolet (EUV) Astronomy primarily of the solar corona. He was the first astronomer to exploit the then new technology of Multilayer coated optics to construct systems which could produce images using extreme ultraviolet radiation. The role of the Multilayer coating is to produce a mirror that is an efficient reflector in the extreme ultraviolet portion of the electromagnetic spectrum. Normally this type of radiation is strongly absorbed by most materials making the fabrication of refractive optical systems impossible. However a thin film coating produced with thin (40nm or less) alternating layers of low and high atomic weight materials which is then deposited on a thick optical substrate can be use to make a mirror. Mirrors coated with these layers exhibit high reflectivity in the Extreme Ultraviolet portions of the Electromagnetic Spectrum and can be used to form high precision imaging systems capable of imaging the sun. Even the earth's atmosphere strongly absorbs EUV radiation therefore to take an EUV picture of the sun requires spaceborne cameras. A spaceborne experiment performed by Dr. Walker and his collaborators resulted in the first Extreme Ultraviolet image of the Sun and Solar Corona. This image was on the front cover of the Nov. 1988 issue of Science Magazine. The courageous decision by Dr. Walker and his team to use on a spaceborne experiment, what was in the 1980's an untried and unproven technology led to increase interest and use of EUV Multilayer coating technology. This technology which has been refined and developed is still very much in use today, and is expected to be used in the manufacture of microchips by 2006. Dr. Walker was also a dedicated teacher and mentor. His first student, Dr. Sally Ride, was the first US female astronaut to fly aboard the space shuttle. Dr. Walkers students have gone on to take their places in academics and industry. He was also instrumental in the mentoring of many African American students of Physics and Applied Physics during his tenure at Stanford. Dr. Walker was, in no small part, responsible for Stanford being the most prolific producers of African Americans with Ph.D.'s in Physics. 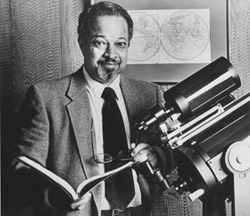 Among the many many wonderful things Art did for the Black community at Stanford was serve on the African and African American Studies steering committee, and act as mentor and teacher to students of color and women in Astrophysics, his specialty. At the festschrift for Art last Fall, we celebrated his innovative research and inspiring teaching in Physics, particularly in Solar Physics, as well as his exemplary contributions to the Black community at Stanford. Happily for us at Stanford and for us as physicists, Art has transmitted his love of physics to generations of Stanford undergraduates through his introductory course on Observational and Laboratory Astronomy, and to dozens Ph.D. students in Physics and Engineering. And, further afield, Art's scientific wisdom has often been placed in the service of this country. Dr. Walker served his nation in many ways as a Lieutenant in the Air Force to being a member of the presidential commission investigating the Challenger accident. We are grateful for the many contributions of this gentleman-scholar. Art was also a dedicated father and husband. We hope that his wife, Victoria Walker, their children, Heather and Nigel, and the rest of Art's extended family will be comforted by the knowledge that his distinguished service has created a permanent legacy at Stanford University and within the discipline of Physics.